Before Syfy started airing this show, I went to a panel at Comic-Con for it. It's a Canadian show so it started airing here a little later. Anyway it was a fun panel and I do like succubi so I was interested in it, but then I somehow missed it when it started and never watched it until a couple of months ago I decided to start watching it on Netflix. Yay Netflix. There's some stuff I really like about this show and then other stuff not so much and I think the ending to season two was so weak that it killed my enthusiasm. I'll watch the third season when it pops up on Netflix eventually, but I don't feel a great sense of urgency about it such as I'd seek out other means to see it if you know what I mean. Anyway Bo is a succubus but she was a lost succubus--she was raised by humans and had no idea she was fae. All she knows/learns eventually is that when she kisses guys (and girls) she tends to go a bit too far and they eventually end up dead. Anyway, she eventually learns she's actually fae but instead of pledging fealty to the light fae or the dark fae she chooses to be independent which is a big thing throughout the series, she's the independent fae. She's also a private investigator of sorts and along with her best friend (and human) Kenzi, they have a little business where they investigate stuff that normally ends up being fae related. That aspect of the show reminds me of Buffy/Grimm/Supernatural. The show also has a love triangle...sort of. The entire second season really toned it down but it's there, one man and one woman which illustrates that Bo is in fact bisexual. She's an equal opportunity lover and has relationships/dalliances with both males and females throughout the course of the series. The overarching mythology of the show is probably my least favorite part about it, both seasons had arcs with big show downs in the end that felt silly. 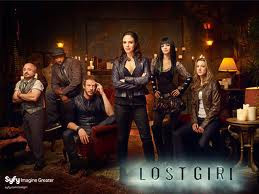 This show, to me, is most charming when it's about Bo and Kenzi's friendship or Bo's search for identity. There are some really super fun recurring characters as well that I like to see. Also it can be genuinely laugh out loud funny which I enjoy. I also love her friendship with Kenzi and I think Kenzi's a lot of fun mostly though sometimes she grates just a little bit on my nerves. Okay I do not hate this show! I actually like it, it's just a bit cheesy with a few things that bother me, and those seem to be sticking out in my memory while I write! One major problem I had with season two was how Bo and Lauren's relationship was written. Lauren had already violated Bo's trust in a big way in the first season, and then in the second season we find out she's been hiding this secret girlfriend in a coma! And as if that wasn't enough, once they resurrected her, they never let her develop as her own character, she existed solely as an obstacle to Bo/Lauren until she died. And the emotional repercussions of Bo killing her, even if it's what they wanted--felt brushed past too quickly. I mean...I don't know this show is just supposed to be good cheesy fun, but the writing of that entire storyline bothered me. Also I liked Ryan so much, he was the first and only one to bring up the fact that Bo also manipulates humans and uses them for information and that even if she technically isn't aligned she favors the light fae. That whole conversation was one of the most interesting things the show had going...and Ryan was just fun. Oh well! I think the fact that it took me so long to watch this proves it was not my favorite show ever and yet I did enjoy it. You could definitely do worse and it hits that sweet spot of cheesy supernatural drama. NO SPOILERS FOR SEASON THREE! If I'm spoiled I probably won't watch, lol. Have any of you guys watched this?